Illustration of tanning, from a book published in the 17th century. Tanning is the process of turning animal skin (often called "hide") into leather. An acid called tannin is generally used. This prevents the leather from falling apart and often gives it a special colour. A tanner is someone whose job is tanning. 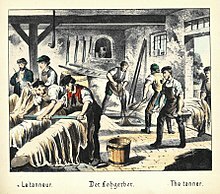 In the past centuries tanners were often poor. Because tanning was a smelly job they often lived at the edge of towns. A tannery is the buildings where the tanners worked with the animal skins. This page was last changed on 12 May 2016, at 10:03.